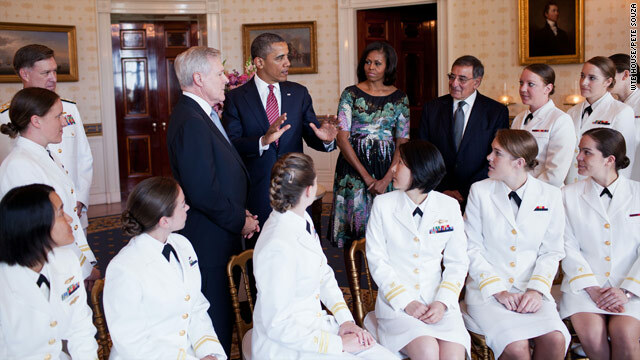 President Barack Obama and First Lady Michelle Obama greeted the U.S. Navy’s first contingent of women submariners to be assigned to the Navy’s operational submarine force, in the Blue Room of the White House on Memorial Day. The 24 women were accepted into the Navy’s nuclear submarine program after completing an intensive training program and serve on ballistic and guided missile submarines throughout the Navy. Also attending were Admiral Mark Ferguson, left, Navy Secretary Ray Mabus and Defense Secretary Leon Panetta, right. Way to go Obama. Equality for all. I am sure Republicans would not have made this happen. Most Republicans are not racist or bigots but most racist and bigots are Republicans. Can't wait to see how the haters are going to spin this one. Ready set go. Hope you had a great Memorial Day Lionel but you may have overdone it on the kool-aid. This is a nice story. Why bring racism into it? Someone doesn't know the history of their party or racism in the US. Why don't you get a library card, its free and paid for by out taxes, so you should have no problem taking advantage of it. Then go look up the history of the Democratic party and you will discover that the Dems are the farthers of racism in the US. Hell they didn't pass a single civil right law! All republican lead initiatives with filibauster votes. Dems started the KKK, and didn't elect a black American until 1973. Quite a bit longer than when the first 26 republicans were elected in 1867. Quit letting the media educate you stupid! .....And again, your side praises Obama instead of the 20 servicewomen. So small and shallow minded, you are. It's just the way you are, I know you can't help it. you are therefore left to your own devices. Your hate drives the discourse you seek , retard. Or, was that the first thing that actually came to your adolescent brain. Through these port holes walk the finest Women in the United States Navy...............Semper Fi ladies! I see obama has found a way to separated veterans and politicalize memorial day...the most divisive president in the history of America... And by the looks of it some of you are ignorant enough to by into it. ONLY AN IDIOT HATER LIKE YOU WOULD SEE THAT FROM THIS STORY. TRULY A SHINING EXAMPLE OF REPUBLITARDISM. HAHAHAHAHA!!! Why is it when a democrat tragically devides our country with racism and class warfare you liberals praise them? Then again conservatives are labled as war pigs of violence, but if you liberals would get an education outside of the media and liberal institutions you would know a little more about the hsitory of your racist party going back to the civil war all the way to socialism took over racism in the 70's. WHY ARE YOU ASKING ME SOMETHING YOU ARE ALREADY CONVINCED YOU KNOW THE ANSWER TO? YOUR BLIND HATRED FOR OBAMA IS THE ANSWER. Having just toured the USS Requin in Pittsburgh, I've got a great deal of respect for those who serve on submarines, irrespecitive of whether they are men or women. They didn't let them on fast attack submarines, only on boomers. 3 monts out to see is nothing. I hope those women can handle that. Just from an hygiene perspective I can't see women enjoying the life of fast attacke sumarie navy. Obama is irresposible, playing social engineering games with our national defense. BETTER YET, WHY DON'T YOU VOLUNTEER FOR MILITARY SERVICE LIKE THESE BRAVE WOMEN HAVE DONE. My girl, Sophie Kim seated on the far left. Good person but dumb as a rock.